December 2016 marked one year since the first wave of Syrian refugees settled in Canada as part of the federal Liberal government’s project to welcome 25,000 refugees. The year since their arrival brought with it hopeful, inspiring stories of Canadians coming together to welcome newcomers. Canada has received a great deal of acclaim from the international community about its approach to refugee sponsorship and is being held up as a model for other countries. Support for Syrian children and youth going to school was recognized as a priority. In spite concerns of that government support was (and continues to be) insufficient to accommodate and meet the needs of students, Canadians have demonstrated compassion for the struggles of newcomers, and enthusiasm to lend a hand. School boards launched a program that allowed Syrian children and youth temporarily housed in hotels to attend school, school communities raised funds to sponsor refugee families, and teachers organized their students to write welcome cards for newcomers and deliver them to Parliament Hill. However, despite all of these examples of genuine goodwill, recent world events have served to undermine these sentiments and Canada is not immune. Reaction to the recent Quebec mosque shootings and political developments south of the border are instead speaking to a shift toward Islamophobia. We are seeing a rising tide of fear and intolerance in a time where there is increasing need for inclusion. Hate crimes are committed against the LGBT community, racial, religious and other minorities, and with this, an approach to inclusion must address all of these realities. Yet Muslims have faced a sizable amount of the hostility. In 2014, the latest year for which statistics are available, Canadian police recorded 99 religiously motivated hate crimes against Muslims — up from 45 in 2012, according to Statistics Canada. Opening doors to welcome refugees to Canada is only the first step of the process towards meaningful integration. The real work of ensuring social inclusion is a much longer-term investment. But the classroom is where many important values such as openness and embracing of diversity are born. Schools should not just accommodate newcomers, Muslim pupils, and their families; especially in the current climate, schools must serve as a space of safety and support. Many resources are available to help teachers and school administrators ensure safe and supportive classrooms, and encourage students to embrace diversity more generally. The National Council of Canadian Muslims, the Islamic Social Services Association and the Canadian Human Rights Commission have created the guide, Helping Students Deal with Trauma Related to Geopolitical Violence and Islamophobia. It provides guidance on supporting students who are dealing with grief, fear and confusion, which can help to create a safer classroom environment. The Harvard Graduate School of Education has also put together a comprehensive list of tips, additional resources and research studies on how schools can work to address bullying and dismantle Islamophobia. The resources can be found here. Social emotional learning (SEL) is another process that can be purposefully integrated into classroom settings to build trust and mutual respect among students. The Collaborative for Academic, Social and Emotional Learning in the United States has several resources for explaining SEL, and approaches and tools for school-based implementation. The US-based Committee for Children also published a list of recommendations for teachers to help children feel safe and supported in this new era. Oxfam UK has compiled comprehensive guidance on how to create “schools of sanctuary”. Major publishing houses have also developed lists of books to help children understand the plight of refugees. The goal of all of this work is to help children and youth navigate the new geopolitical landscape. Schools can empower students to think critically about the information they are receiving, make thoughtful decisions in determining their own values and place in these discussions, and finally to take action. All schools have homegrown approaches and opportunities for student engagement. Samara Canada, provides a variety of resources for classrooms here, here and here. Oxfam UK has a useful resource on how to teach controversial issues in the classroom. Radical Teacher, an academic journal on teaching theory and practice, has a resource page with lesson plans on a wide variety of current political issues including the U.S. immigration ban. In this unpredictable, uncertain political climate, business as usual is insufficient. Teachers need targeted strategies to ensure safe and supportive environments for their students and to promote a school ethos based on inclusion and respect. Students need avenues for peaceful, meaningful engagement in issues that affect them. Both teachers and students have a critical role to play – keeping fear out of Canadian classrooms depends on it. On the 5th anniversary of the Syrian Crisis, we take stock of the realities on the ground for Syrian children and Canada’s role in helping to prevent a lost generation of children. Five-year-old Syrian children are as old as the Syrian crisis. They have known only war for the entirety of their young lives. Over the past few months, Canadians have welcomed thousands of Syrian children and their families into our lives and if we are are honest, into our hearts. But today’s anniversary is a sobering reminder of where they have come from and how far we as a global community still have to go to help address this crisis. Today our televisions, newspapers and radios will include the images, sounds and stories of a civil war that continues to rage—5 years on. By many accounts, the war was triggered by a series of events that followed on from a small group of teenagers who painted revolutionary slogans on a school wall. Gives one pause. Today, on the fifth anniversary of the war in Syria, more than three million children and youth are out of school in the Syria region. An entire generation is at risk of exploitation and their future threatened by a conflict with no end in sight. Education across Syria is under attack. There have been more than 4,000 attacks on schools since the war began, from the bombing and shelling of buildings to armed groups taking over classrooms for use as military bases and detention centres. The UN estimates that 1 in 4 schools in Syria have been attacked. School enrolment—close to 100% in many areas before the war—has plummeted, with more than 2 million children in Syria now out of school. Decades of educational progress has been reversed in a few years with dire consequences in the immediate and long term. Education has a catalytic effect on children’s well-being, development and future prospects as well as on a country’s peace, stability and economic development. Many worry the window of opportunity for getting children, and Syria, back on track is closing… and fast. Education plays an integral role as a driver of economic growth. Access to good quality education is critical for helping people rise out of their circumstances—higher levels of education lead to higher wages. Economists estimate that for every additional year of schooling, an individual’s potential income increases by 10%. Conversely, low quality, or lack of, education leaves young people facing unemployment or low-paid jobs, which in turn can make them vulnerable to recruitment by armed groups who offer them a source of income and prestige. There is strong evidence showing that education, and in particular secondary education, reduces the likelihood of conflict by increasing the income opportunities and life choices for young people. In Syria, the cost of lost education opportunities are staggering. A recent study on the cost of the impact of the Syria crisis estimates losses of US$ 10.7 billion, or 17.7% of Syrian GDP due to children and youth dropping out of school. Syrian children who do not complete primary school education are likely to earn 32% less in their first job than Syrian children who completed secondary school and 56% less than Syrian children who completed university. The direct cost of replacing damaged, destroyed or occupied schools, lost school equipment and training replacement teachers could be $3.2 billion and at this rate, climbing. Schools in Syria move underground in a desperate attempt to keep children safe from blasts. Canada has been active abroad and at home in addressing the education needs of Syrian children and youth, but we can do better. Beyond a doubt, the way Canadians have welcomed Syrian newcomers into their homes and communities and taken an active role as citizens to complement the government support is remarkable. But we should not lose sight of the bigger picture—a sustainable solution to the problem begins in Syria. A truly robust response to the crisis will have to include a cease fire that holds and significant financial allocation in support of ongoing humanitarian efforts in the region. That investment should prioritize education. Canada is taking a leadership role in a few initiatives to support children in the Syria crisis and those affected by humanitarian crises more broadly, to access quality education. In October 2013, the No Lost Generation (NLG) initiative was launched backed by partners from UN agencies, NGOs, donors, and governments—including Canada, which contributed $50 million in January 2014, and $8 million in funding specifically for NLG in Iraq in October 2014. The overarching strategy that supports the NLG initiative is focused on quality education, child protection, and adolescent and youth engagement activities both inside Syria and its five neighbouring countries (Lebanon, Jordan, Iraq, Egypt and Turkey). It underlines that strategic investments in these areas can provide children with the skills and sense of civic responsibility to help rebuild their society. The fourth international pledging conference for the Syria crisis took place in London last month. It called for US$ 1.4 billion per year in pledges for the education sector to provide schooling for 1.7 million children and youth in host countries, and schooling for 2.1 million within Syria. Total pledges amounted to over US$ 11 billion, and at least US$ 600 million for education in 2016. By far the most prominent donor for EiE was Norway, which announced that 15% of its contributions to the pledging conference will focus on education. Canada has been acting in a leadership role in global efforts to reform aid architecture and address the financing gap for education in emergencies. It is co-chairing the Technical Strategy Group looking to establish a new Common Platform. More information on the discussions can be found here. Consultations in Canada have taken place in Toronto (June 2015), and in Ottawa last month (report forthcoming). Ensure parties to the conflict cease all attacks on schools, hospitals, and other critical civilian infrastructure and that their obligations to protect civilians are met. Support education in besieged areas by training teachers and school personnel in conflict-sensitive approaches to education, including how to keep children safe while in school. Work across sectors to address the wider vulnerabilities that keep children out of school. Invest in measures that build greater social cohesion among refugee and host communities by supporting both groups’ needs equitably. Provide funding that reflects the needs on the ground. Deliver long-term, predictable funding for a comprehensive plan for education both inside Syria and across the region while at the same time being more flexible with funding, since partners often need to respond quickly to unexpected opportunities or constraints, as situations change rapidly and sieges tighten and loosen. Syrian children, who have lived through 5 years of conflict, will one day be responsible for shaping and leading their own nation as doctors, teachers, engineers, lawyers and parents. We can all do more, including our government. Doing our part to prevent a lost generation of Syrian children and youth is in our hands. Brotherly love between 5-year-old Ayman and his three brothers at Za’atari camp in Jordan. Photo credit: Save the Children. All names have been changed. Close to a month has gone by since footage went viral of Prime Minister Trudeau welcoming the first planeload of Syrian refugees at Toronto’s Pearson Airport. Since that time, more than 6000 Canadian newcomers have arrived. Sponsorship groups and settlement agencies are busy supporting families to adjust to their new lives in Canada. According to the updated plan, Canada will welcome an additional 4000 Syrians by mid-January, and another 15,000 by the end of February for a total of 25,000. Even more are slotted to arrive over the course of 2016. The exact number of children in that first 25,000 is unknown. However, it’s safe to assume that at least half are under the age of 18: the average age in Syria is 18, and according to UNHCR, more than 50% of Syrian refugees are children under the age of 18 – in other words, at least 12,500 will be school-aged. Can Syrian refugee children realistically start school in Canada? Are we ready for them? And can they start tomorrow? Indeed, many of them already have. It’s hard to put it better than our ambassador to Lebanon, who said goodbye to refugees at the airport in Beirut before they boarded flights to a new home: “In Canada, we believe that your heart is big enough to love Syria and to love Canada.” By properly equipping our classrooms, we can help ensure this is a reality for all of the children in our schools. Canada has a long history of immigration and refugee settlement. Our current efforts to integrate Syrian refugees – even a population this size, and within these short timelines – are not new. We have been here before. In 1979-80, Canada opened its borders to 60,000 Indochinese fleeing Vietnam. Since 2006, Canada has settled an average of 25,000 refugees each year. Teachers, principals and our wider school communities know a thing or two about what newcomer children and youth bring with them. Below is an overview of the opportunities and challenges alike and a list of resources for teachers. We invite you to recommend other resources below, as well. Schools are critical partners in promoting the successful integration of former refugees into Canadian society. Teachers, principals and our school communities should recognize refugee children and their families not simply as passive recipients of support but rather permanent residents and active agents in nation-building. 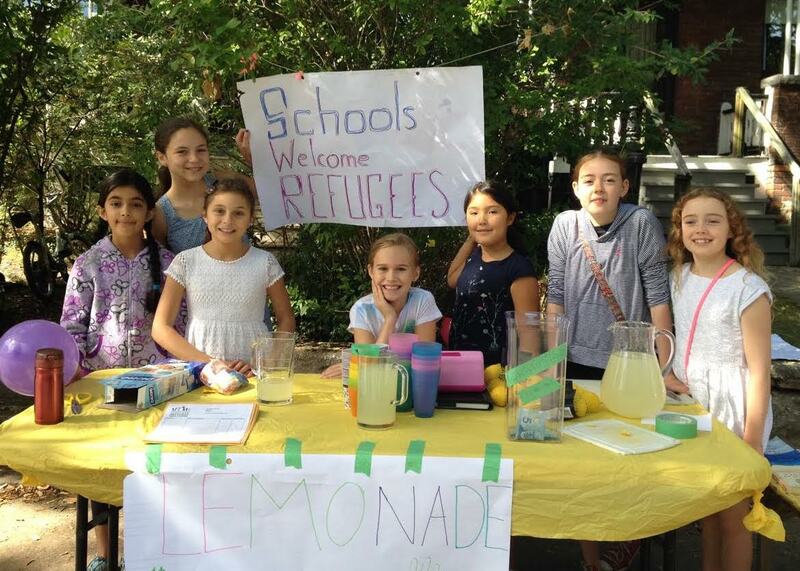 Refugees enrich our society, and have a lot to offer our Canadian school communities. Strong cultural values for education – Prior to the crisis, school enrollment and literacy rates among Syrians were very high. In 2011, literacy rates for youth aged 15-24 hovered around 95%, and primary school enrollment was 91%. While many children may not have had the opportunity to learn after fleeing Syria, they and their families will be eager to see them return to a classroom. The global meets local – While a scan of the average classroom across Canada will tell you this is already happening, the newcomer students can challenge the status quo and expose us to new ideas and ways of doing things. Excitement about a new home – It’s always an enriching experience to see life through someone else’s eyes. Rather than focus on the negatives, the newcomer children will no doubt bring a great deal of enthusiasm about their new home and provide us and our children an opportunity to do the same. Mentorship and leadership skills development – There are a number of children in Canadian schools who speak Arabic. These children can act as peer mentors/tutors for younger children. At the same time, peer support or “buddy” programs pairing newcomer children with Canadian students can prove mutually beneficial as we saw in one Edmonton school. Potential Challenges for Canadian classrooms…and top tips! In a recently-released OECD study on integration issues and education systems, Canada fared quite well compared to other countries. But there is a lot of room for improvement, and we need to be aware of potential pitfalls. Syrian newcomer children possess extraordinary resilience that has seen them through the last few months or years and yet, they will inevitably face a number of challenges when they first enroll in school. They will be reliant on teachers and classmates to help them navigate the new system. Psychosocial support needs – There has rightly been a great deal of focus on the psychosocial impact of the crisis on Syrian children. In the field of education in emergencies we know that, on average, only 20% of children coming out of crisis are in need of additional, intensive therapy. This statistic is not meant to undermine the seriousness of the situation but instead points to the fact that a majority of children will be able to thrive in a situation where they are provided with a sense of normalcy – where they feel they are supported, welcome and feel safe. School can provide that, in addition to referrals for those students in need of more support. The Peel District School Board in Ontario, for example, is reportedly working with the Canadian Centre for Victims of Torture to offer referral support. Reservations about school – In the last four years more than half of all attacks on schools globally have occurred in Syria. This makes for a total of more than 4,0000 attacks in Syria since 2011. Schools can be targeted because they are public institutions, for promoting what is thought to be non-Islamic education, or because they are occupied by displaced populations from neighbouring communities. This means that even where schools remain open, parents fearing for their children’s safety often keep them at home. This mistrust in the school system has been known to remain even when families have reached safer areas, such as Canada. It will be important to integrate parents in schools as much as children. Innovative opportunities for learning from and supporting these parents could be fostered through establishing parent groups, to better integrate them into the school community such as the ESL classes initiated by parents at a Burbank, California school. Language challenges – In Syria, children learn exclusively in Arabic throughout their school career. Many Syrian children arriving in Canada will have spent time in a school system in Iraq, Turkey or Lebanon, where the language of instruction is Kurdish, Turkish, or Arabic with English and French as separate subjects and languages of instruction for math and science only. Overall, many children will have received very little formal education. Language programs like LEAP offered by the Toronto District School Board support students to develop the English language skills needed for success in the classroom. It is important to note, however, that these types of programs should complement regular classroom learning that provides invaluable opportunities for newcomer children to learn along with their Canadian peers. Unfamiliar classroom protocol and teaching styles – Interactions with and between teachers and students in a Canadian classroom will be a new experience for Syrian children in many ways. The reality is less than 50% of Syrian children have had the opportunity to go to school since the crisis began. Rote learning is the norm in Syria and other countries along their route to Canada and as such, the more co-operative and participatory approach to teaching and learning in Canada will be an adjustment. Newcomer students may not understand that they are expected to ask questions about lessons and homework or participate in activities, for example. Students and teachers may notice minor behavioural oddities, such as newcomer students looking distracted, walking around the classroom, or hoarding items. The “buddy” system mentioned above can go a long way to give children confidence to approach the teacher. Teachers should also be aware of behavioural challenges and consider discussing one-on-one with students when they first enroll and holding regular “check-ins”. Challenge of equivalencies – Fortunately, school boards here in Canada have a great deal of experience with this and yet it is important that we ensure children’s prior learning is recognized and as much as possible, that they be placed in age-appropriate classrooms. Programs such as LEAP must be viewed as a bridging opportunity, not as an indication of ability or low potential. Lack of education is not the fault of these children. Establish policy and provide support for newcomer parents to engage with their children’s school community. Dr. Sarah Dryden-Peterson, a Canadian and a professor at the Harvard Graduate School of Education, is a specialist in refugee education both in the countries of origin and asylum. Her work highlights the needs and gaps in the current offerings. Below is a list of appearances, papers, articles and editorials by Sarah drawing attention to this important line of work. 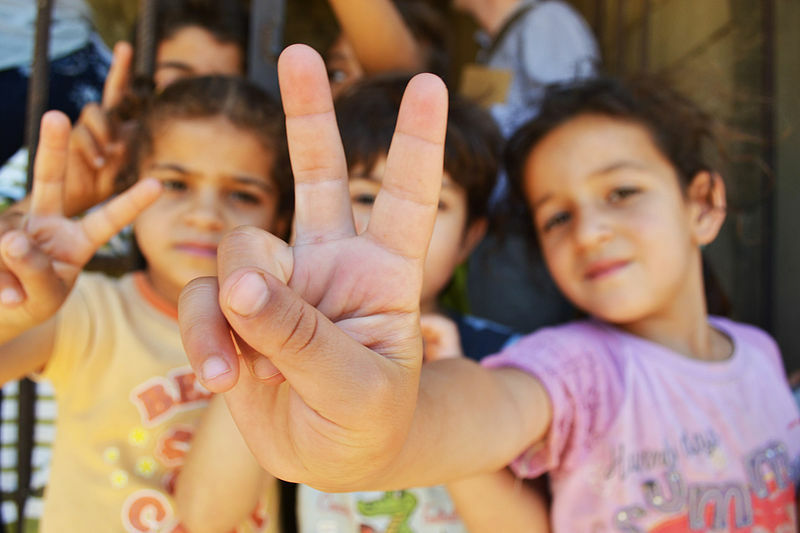 As part of the Schools Welcome Refugees Initiative profiled earlier on the blog, a group of volunteers put together a comprehensive list of resources for teaching about the refugee crisis and wider issues of global education in the Canadian classroom. These resources include recommendations for supporting newcomer student learning and creating a more inclusive classroom environment. Colorin Colorado: How to Support Refugee Students in the ELL Classroom. Foundation House – The Victorian Foundation for Victims of Torture: School’s In for Refugees; A whole-school approach to supporting students of refugee background. On the evening of November 12th, I was in a taxi in heading to dinner with colleagues in Beirut when I heard the news. A suicide bomber had detonated in a southern suburb. The number of deaths, injuries and damages unknown. By the time I arrived at my destination, an outdoor restaurant in well-known Zaitunay Bay, a second bombing had occurred and the news had spread across the city. At least 40 dead and 200 injured, the most deadly attack since the end of the Lebanese civil war in the early 90’s. Looking around me it was impossible to tell that anything out of the ordinary had happened. Waiters patiently took orders, customers perused the menu and chattered on. No formal announcements were made or extra security in sight. Life continued uninterrupted. Normally I hear about such tragedies from the safety and security of my home in Canada. This time, even though the bombings were less than 2 kilometers from my hotel, I still felt like I was in another country. As a Lebanese friend put it to me that evening, “We have become immune”. What she really meant is that they have become used to this. Attacks in Lebanon and across the Middle East are ‘normal’, and, many now fear, will become the new normal in Western countries. The next day my colleague and I were again horrified at the news—this time coming from France. We worried for our colleagues and friends back at UNESCO headquarters in Paris. Her husband had been watching the game in the Stade de France, and updated her every few minutes on his safety and journey back home. Suddenly we were on the other side of tragedy again—I was asking about the safety of my friends, instead of reassuring my own, and hearing the news from the safety and security of another country. Thankfully friends and colleagues were shaken but unharmed. Relief quickly gave way to sadness and grief, however. I wondered—what is next? Where is next? Above all, I wondered why. Why are these atrocities happening, around the world and at an accelerated pace? Why are young people, some as young as 20 in the case of Paris, driven to these ends? And what can I do, as an education in emergencies specialist working internationally, and as a Canadian citizen living in Toronto, in the face of such tragedy? Over my next few days in the Middle East, I saw what might begin to provide some answers. In my conversations with Ministry of Education officials, aid agency staff, refugee camp coordinators, country donors, local NGO workers and teachers, Syrian refugee parents, children and young people, across Lebanon, Jordan and Iraq—the common message was that a person with viable alternatives rarely chooses terrorism. A child or young person with access to quality education and meaningful livelihood opportunities is rarely drawn to radicalism. When all other life-saving supports are assured, such as food, water, shelter and protection, quality education can deliver hope for the future, build individual resilience and restore meaning to life. School can provide a sense of belonging to combat feelings of bitterness or alienation, and a commitment to live for oneself and one’s family. Unfortunately, the international community, including Canada, has fallen far short on its commitments to fund education as a key intervention in humanitarian crises. The Regional Refugee and Resilience Plan (or 3RP) is the international community’s overall costed strategy for the region—Egypt, Iraq, Jordan, Lebanon and Turkey—to assist with the integration of Syrian refugees, as well as provide support for the impacted communities and help to alleviate the additional burden on the national systems of these host countries. As of July, the 3RP had received only 37% of the funding needed for 2015. Ministry of Education staff I spoke with claim this number represents only committed funds, and actual funds delivered barely reach 17%. Education is still one of the poorest sectors in humanitarian responses. So far this year, of the $455 million requested, the Sector has received a commitment of only $129 million to support educational opportunities for 2.3 million refugees and community members. The massive gaps in donor financing to the Syrian crisis response and to education specifically, should concern us all. As Canadians, we should also be aware of issues with our government’s commitment to domestic refugee resettlement and education. Dramatic funding cuts to education settlement services in 2010, capacity support for teachers and administrators to welcome newcomer students and a more welcoming policy environment related to access to schooling are just some of the concerns to be addressed here at home. A summary of the issues was posted here last month as well as a template for a letter to your MP to ensure these issues are being discussed as part of the wider national discussions to #WelcomeRefugees. We are using this blog as a way to highlight the integral role of education in the response to the global refugee crisis—in the countries of origin, in the countries of first asylum and here in Canada. Over the last few months we have seen citizens across the country inspired to support Syrian refugee children including in our schools and in our communities. In next week’s blog post, we’ll focus on the impact of the crisis on Syrian children’s education, including the long-term implications and what can be done both here in Canada and abroad. 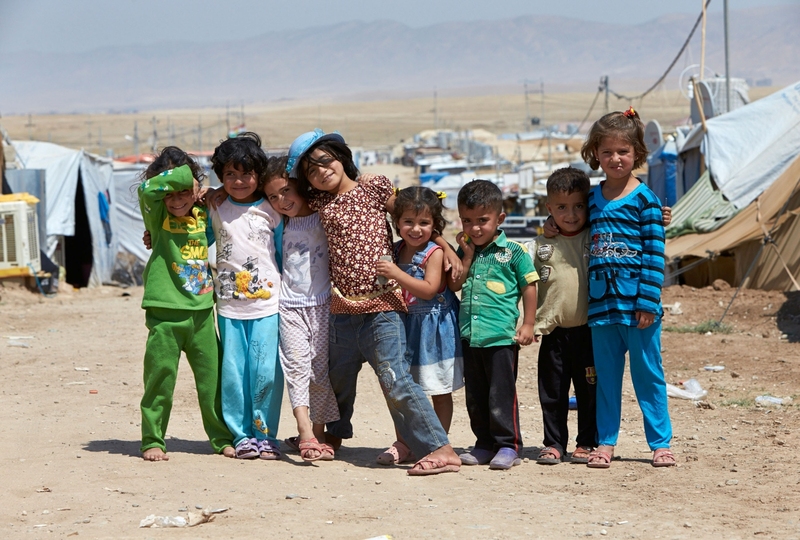 Check back next week to follow the discussion on Canada’s role in preventing a lost generation of Syrian children. Schools are integral in helping newcomer children navigate their new communities. Over the next couple of years, in response to the Syrian refugee crisis, Canadian schools will receive students—who have lived through difficult conditions—and support their transition to Canadian society. Schools will also have an important role to play in educating Canadian students and families about Canada’s responsibilities to asylum seekers, and creating a positive, inclusive climate that will facilitate the successful integration of newcomers. Schools Welcome Refugees is a grassroots initiative that asks school communities to do something more—specifically, to engage with Canada’s private sponsorship program and raise funds to sponsor refugee families coming to Canada. The initiative was born last month when two schools in the west end of Toronto, Dewson Street Junior Public School and the Grove Community School, set out separately to sponsor a refugee family. Each raised over $35,000 from their communities in just a few short weeks, and took the first steps towards sponsorship. Now both of these schools have been matched with families seeking asylum, and are expecting those families to arrive within a few months. There are 15,500 public elementary and secondary schools in Canada. Many schools are already set up to do considerable fundraising, making it possible to spread the financial commitment of refugee sponsorship across a larger number of supportive individuals. School communities are natural fits for refugee settlement activities—particularly where there are already strong resources like government-funded Settlement Workers in schools to provide support. We believe that 1000 schools across Canada could sponsor refugee families became the Dewson slogan. In September, the Dewson school community launched the “1000 Schools Challenge”, and developed a website that shares information about how to help schools get organized. It includes links to educational resources for teachers and families, frequently asked questions, and to-do lists and tools for organizers (surveys, pledge forms, logos). The idea took off, and received considerable media coverage including on television, in the Globe and Mail and Toronto Star. Since going public in mid-September, Dewson has heard from school communities from Fredericton to Kamloops who want to get involved. Fifteen schools that we know of have already taken the challenge, and there are ongoing discussions in many more. A key aspect of the 1000 Schools Challenge is how it brings curriculum expectations in the area of global citizenship to life in schools. Students have a chance to see and be involved in working together to make a difference locally in addressing a huge global problem—one that involves doing more than simply making a donation. Thinking one family at a time—talking about children like them in refugee camps—also helps to humanize the issues, emphasizing similarities rather than differences with those far away. Older students are motivated to learn more about the conflict in Syria and the surrounding areas, and think about civic rights and responsibilities in a global frame. All students can engage actively in discussions about what it takes to make someone feel welcome, and what they can do to contribute to that outcome. It makes welcoming refugees and inclusivity more broadly part of the culture of the school. If you are an educator or a teacher, we encourage you to connect with the 1000 School Challenge and see how you can get involved. There are many ways that parents, teachers, students, and school communities can take action. How is your school preparing to welcome refugees? Since 2011, more than 4 million Syrians have fled the country and 7.6 million more are internally displaced. Close to 3 million Syrian children and youth have been forced out of school as a result. Development gains in Syria have been reversed dramatically. In 2011, literacy rates for youth aged 15-24 hovered around 95%, and primary school enrollment was 91%. By the 2013/14 school year, primary school enrollment had plummeted to 38%. Today, enrollment rates in Aleppo are at 6%. Those of us working in the Education in Emergencies field are familiar with the numbers. We know that in countries seeing an influx of refugees, there is a host government under strain. Many of our colleagues have been working tirelessly in Lebanon, Jordan, and Turkey since 2011 to support access to quality education for Syrian refugees. Recently, the thousands of Syrian refugees arriving each day on European shores and across borders have raised concerns about local capacity to provide adequate settlement services, including education. While there is much attention, and rightly so, on the plight of the Syrian refugee community, it is important that we not lose sight of the fact that there are currently 16 million refugees globally – more than half of them children. In Canada, our intake numbers have so far been low, but thanks to a groundswell of public support for the plight of the refugee community over the past few weeks, this is set to change. While the actual number of refugees that will be settled in Canada is yet to be determined, it is expected that up to 50% of the refugees will be children. Given the amount of time they have likely spent out of school and the harrowing experience of fleeing conflict in their home countries and leaving their loved ones behind, these children will need to be well supported to ensure their successful integration into the Canadian school system. How are we ensuring refugees have access to critical education services, here at home? Citizenship and Immigration Canada (CIC) sets policy and program direction for settlement services, and provides funding to community agencies that deliver settlement programs on behalf of the CIC. In elementary schools, we have programs like Settlement Workers in Schools (SWIS). In high schools, Newcomer Orientation Week programs are led by trained secondary school peer leaders who were once newcomers themselves. Many of these initiatives have been kept alive, with a smaller reach, in recent years through alternative funding sources. These innovative programs and others like them are critical for the integration of refugee families into Canadian communities. However, education settlement services have suffered cutbacks in recent years along with the larger package of settlement services. Since 2005, millions have been cut from Canada’s immigration and settlement services budget. Millions more have been underspent. Over the lifespan of the 2005-2010 Canadian-Ontario Immigration Agreement, $207 million was underspent. Another $53 million was cut in 2010. Of this total, over 80% was pulled from Ontario, a province which receives more than half of all newcomers to Canada. Contracts with many service provider organizations were not renewed, and most agencies had to cut their budgets by 20-40%. Finally, over the last three years, the immigration department returned $350 million to the federal treasury, unspent. Fewer parents and children receive the information they need. Settlement workers support parents to navigate the new school environment. Some of the many invaluable services they can provide include coordinating culturally appropriate interpretation and translation when helping to facilitate access to local services and identifying support for children struggling in school. Before 2010, there were individual settlement workers in many schools across Ontario. Today, settlement workers cover several schools and some schools do not have access to this type of support at all. Cuts have also impacted the Library Settlement Partnerships program offering workshops for newcomer families, one-on-one referrals and community outreach, eliminating the role of coordinator and reducing the program’s reach. Fewer peer leaders from the newcomer community in schools. Children are incredibly resilient. As we often reference in our international work, research on children’s psychosocial needs shows that only about 20% of children who have faced experiences of humanitarian crisis need intensive support. A supportive, family, community and school environment can help most children to cope effectively. Peer leaders especially can help refugee and newcomer children to connect with people who have had similar experiences. Innovative programs delivered through a partnership of settlement workers and school staff like Newcomer Orientation Week have downsized, from a full week of orientation to three days, and pool students from several schools. Fewer resources from CIC have also contributed to cuts to the Welcome and Information for Newcomers program for middle-school students resulting in fewer peer leaders per school. Elimination of valuable oversight and coordination roles. Cuts have eliminated the position of the Ontario provincial coordinator for SWIS, which coordinates resources, training and promotion of the program in 19 Ontario school boards. Long-term impacts of short-sighted funding. The program cuts in recent years have undermined the existing human capacity and infrastructure (including rent, phones, computers) capacity of immigrant and refugee-serving agencies to support newcomer families in the immediate term as outlined above. In the longer term, the cuts have resulted in lost capacity as experienced employees of these centres seek out other, more stable opportunities for employment. And even more broadly, cuts have forced agencies themselves to shift their focus towards addressing a different community need that is eligible for more predictable funding support. In some cases they even close down completely. It will difficult to attempt to reestablish and expand a system of settlement support for newcomers that has been so adversely affected over the past five years. A reinstatement of funding to pre-2010 levels, at a minimum, will go a long way to ensuring education programs serve the best interests of children, and support our schools in their efforts to welcome refugee children and their families into our communities. We are asking MPs to work together to develop a strategy that includes increased funding through the CIC budget. Write a letter to your MP, using the template here. Find your MP here. Get in touch if you’d like to be involved in future campaign work on this issue. During the United Nations General Assembly in September, world leaders adopted the Global Sustainable Development Goals in New York. At no other time in recent history has the reality of these discussions and their implementation to address the needs of the global community been something so tangibly close to home. Save the Children, CfBT Education Trust, American Institute for Research. March 2015. “The Cost of War: Calculating the impact of the collapse of Syria’s education system on Syria’s future.” Online. OCASI. March 2011. “Background Information on CIC Cuts.” Online. People for Education. April 2011. “Funding Cuts Devastate Programs for Young Newcomers.” Online. USAID. January 2014. “The Fiscal Impact of the Refugee Crisis in Jordan”. “These startling statistics all add up to one stark conclusion: business as usual is nowhere near good enough. Unless we accelerate progress considerably, we will fail to meet the needs of the world’s children, particularly the poorest girls. The Oslo Summit for Education in Development is just around the corner. On July 6 and 7, 2015, stakeholders including heads of government, education ministers and international organisations with representation from Canada will come together with the aim of mobilizing political commitment to the world’s 58 million out-of-school children and to achieve better learning outcomes for those in school. As part of the preparation for the Summit, discussions related to the potential EiE Fund and the quickly approaching launch of the SDG’s education actors have been compiling research and analysis on the current state of financing for education. Check back here for updates on the discussions and Canada’s role. Canada is taking an active leadership role in efforts to support children’s right to education in crisis. In recent months, Canada has pledged support for Education in Emergencies and committed $120 million CAD toward to the Global Partnership for Education to the 2015-2018 replenishment period. Education for children in crisis has also figured prominently in discussions relating to the future strategic direction of Canada’s education strategy for development assistance. Globally, education in emergencies is gaining prominence in discussions and events on the post-2015 development agenda. In the coming months, there will several critical opportunities for Education in Emergencies to be highlighted, including at the Oslo Summit on Education for Development, July, 2015, the UN Summit to adopt the Post-2015 Development Agenda, September, 2015, the United Nations Climate Change Conference (COP 21), December, 2015, and at the World Humanitarian Summit 2016. The Overseas Development Institute (ODI) has drafted a paper on education in emergencies and protracted crises as a background note for the upcoming Oslo Summit on Education for Development. The ODI paper is being drafted in two stages to allow for consultation and input; the initial draft was used basis for online consultation coordinated by the Inter-Agency Network for Education in Emergencies (INEE). A global series of face-to-face consultations have been held as an opportunity to further recommendations to high-level policy makers to ensure strong support and finance for Education in Emergencies. We held a face-to-face meeting of Canadian-based education actors Friday, June 5th in Toronto to discuss the questions proposed by the INEE as well as Canada’s role in moving forward. The INEE Global Consultation Canada meeting notes. Our follow-up call to discuss Canada’s role will be Friday, June 19th at 1pm. A standardized approach to training for humanitarian response; developed, organized and instructed by Canadian expertise from the global humanitarian sector. Successful applicants will be informed of registration steps. The 2013 Canadian Disaster and Humanitarian Response Training Program will provide interested medical students, residents, public health students, other graduate-level students with relevant backgrounds, mid-career professionals and humanitarian workers with the globally-recognized competencies relevant to humanitarian work. The program will include both in-classroom learning as well as participation in a 3-day Field Simulation at the Koffler Scientific Reserve ksr.utoronto.ca/ Content for this program will be informed by expert practitioners and organizations working in the field. Early March marks two years since the crisis in Syria began and there is very little indication that the situation is improving. Save the Children and UNICEF both released reports this week highlighting the impact the crisis is having on children and stressing the importance of education – even in the face of an such tragedy. As of March 2013, there were more than 1 million people, 52% of them children, registered as refugees living otuside the country. With the support of the humanitarian community, many children living in camps, while they face severe overcrowding and uncertain futures are able to realize their right to education. We'll be in touch about the next phase of the EIE Platform consultations. More info when we have it!